As the weather improves, it’s tempting to throw caution to the wind and get out there and run with abandon. But that’s a bad idea. Not warming up properly or overdoing it can get you sidelined long before cross country or marathon season roll around. Here are some of the most common running injuries, along with tips on how to prevent and treat them. Shin splints are an overuse injury characterized by inflammation building up in the soft tissue in the front of your shin. There are two types: anterior and posterior. With both, the key is to reduce the inflammation. Several home treatments can help if the injury is minor. Lie on your stomach with a foam roller on the muscles next to your shin bone (whether the pain is on the inside of the bone or the outside). Roll up and down until you find tender spots, which will feel like a bruise. Once you find the spots, hold constant pressure for 20-30 seconds. This will break up adhesions in the muscle and allow it to heal properly. You can wear compression socks during your runs, or use kinesiology tape directly on the muscle. This will compress the soft tissue to reduce the pain. Get your shoes checked by a chiropractor, physical therapist or running specialist. They may be incorrect for your gait or running style. This can be an easy fix if you commonly develop shin splints. Stretching your calves and shins before runs is essential. Make sure to go through a proper warm-up before your runs and finish with a cooldown stretch. The best thing for shin splints, or any overuse injury for that matter, is rest. Allowing your body time to heal properly is an ideal way to reduce inflammation and pain. Stress fractures are a completely different beast. These are also caused by overuse. If you suspect a stress fracture, get checked by a professional. With stress fractures, you have to rest and allow the bone to heal. If you keep running, you will only delay the healing process. You can compress the area of the stress fracture, whether it is in your feet or shins, to promote faster healing. Icing helps to numb and alleviate the pain during the process. Plantar fasciitis is inflammation in the fascia, a thin, cobweb-like layer of tissue on the bottom of your foot. Usually, the pain with this condition happens when you wake up in the morning, so follow these steps before you go to sleep and as you wake up. 1. Get a tennis ball or frozen water bottle and roll it underneath your foot. You will find tender spots. Once you find them, hold constant pressure. This will break up adhesions in the fascia and allow it to heal properly. If you use a frozen water bottle, you will be able to break up the adhesions while also numbing the area. 2. Stretch. You need to keep the fascia flexible and pliable. There are basic stretches you can do on your own, including grabbing hold of your foot and taking it through a full range of motion, circling in each direction, up and down, etc. This will allow the fascia to stay flexible. 3. Kinesiology tape the bottom of your foot. This helps to promote the normal healing process and reduce the pain. 4. From a medical professional, seek Instrument Assisted Soft Tissue Mobilization (IASTM). This involves using a tool and a lubricant to break the adhesions in the fascia and promote proper healing. 5. Rest. Giving your fascia and muscles time to heal is crucial for the healing process. 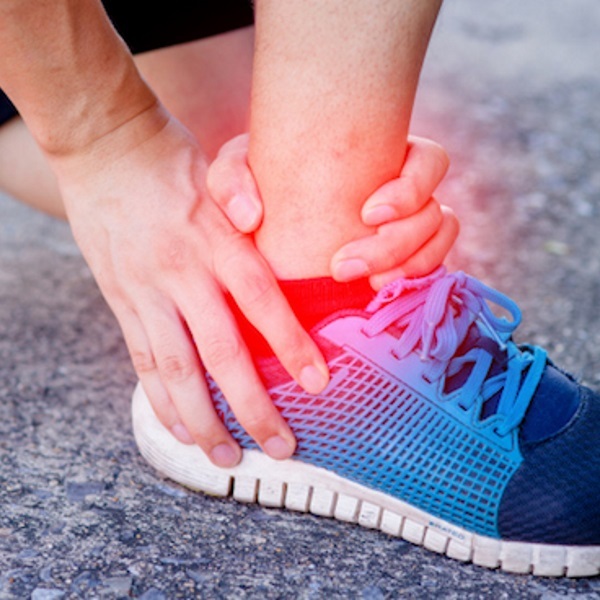 This is another overuse injury, one where inflammation builds up in the Achilles tendon, producing severe pain that can even move up into the gastrocnemius and soleus (the two calf muscles). Foam rolling for Achilles tendonitis gets the calf functioning the way it is supposed to. Icing the area directly will help get rid of the inflammation. Make sure to get your shoes checked by a professional. If shoes don’t fit properly, they can rub on your Achilles tendon during runs, making the inflammation worse. Runner’s knee, also known as patellofemoral pain syndrome, comes from inflammation in the patellofemoral tendon, which connects your quad muscles to your kneecap. This is another example of an overuse injury. Compression is the best thing you can do for runner’s knee, as it takes pressure off the tendon that supports your knee. Kinesiology tape allows your kneecap to track properly during your runs. Foam rolling through the quads, IT band and hamstrings alleviates tension in those muscles, which can aggravate the condition. Icing directly over the patella tendon reduces inflammation and numbs the pain.